The role of a phlebotomist is a great opportunity to gain access into the health care profession. You may not need any specific qualifications to train as a phlebotomist, and training is offered on the job. However, a knowledge of the job and environment, GCSEs qualifications, a first aid certificate and a driving licence may be helpful. Within the role of a phlebotomist, you will be responsible for the collecting of blood samples from patients, labelling them correctly and sending them off to the laboratory for analysis and testing. In order to be successful in this role, you will need to possess a calm and friendly manner, with the ability to put patients at ease. Some may be frightened of needles of blood, so being able to deal with these issues in a sensitive manner will be an important aspect of the role. Many of these vacancies will be advertised on hospital websites, NHS job boards, council websites and websites of private health institutes. You may also find some vacancies advertised on national job websites occasionally. The application process is an application form followed by a face to face interview if shortlisted. In most cases, your cover letter will be to request an application pack from the Recruitment Department. 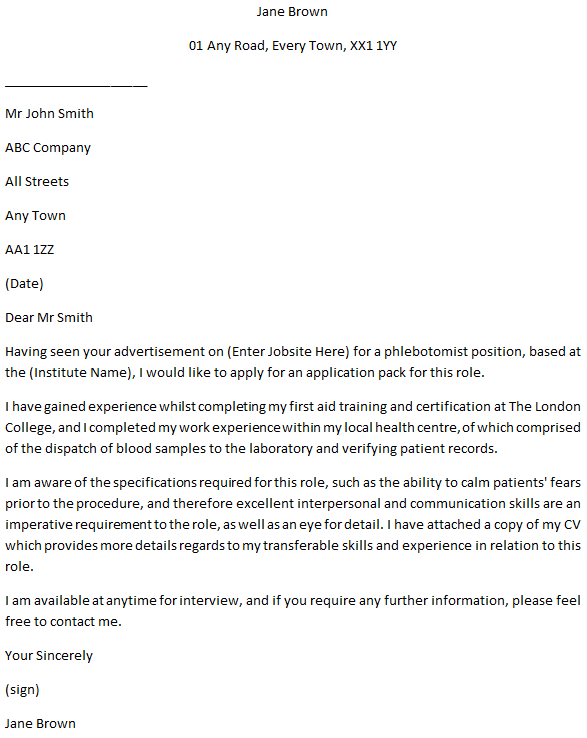 Having seen your advertisement on (Enter Jobsite Here) for a phlebotomist position, based at the (Institute Name), I would like to apply for an application pack for this role. I have gained experience whilst completing my first aid training and certification at The London College, and I completed my work experience within my local health centre, of which comprised of the dispatch of blood samples to the laboratory and verifying patient records. I am aware of the specifications required for this role, such as the ability to calm patients’ fears prior to the procedure, and therefore excellent interpersonal and communication skills are an imperative requirement to the role, as well as an eye for detail. I have attached a copy of my CV which provides more details regards to my transferable skills and experience in relation to this role. I am available at anytime for interview, and if you require any further information, please feel free to contact me.